Apprill, A. (2019). On-site sequencing speeds up and re-directs field-based microbiology. Environmental Microbiology Reports, 11, doi: 10.1111/1758-2229.12732. Gerringer, M. (2019). On the success of the hadal snailfishes. Integrative Organismal Biology, obz004, doi: 10.1039/iob/obz004. [This article has been published as OPEN ACCESS]. Stewart, L., Algar, C., Fortunato, C., Larson, B., Vallino, J., Huber, J., Butterfield, D., and J. Holden. (2019). Fluid geochemistry, local hydrology, and metabolic activity define methanogen community size and composition in deep-sea hydrothermal vents. The ISME Journal, doi: 10.1038/s41396-019-0382-3. Thornton, B. (2019). Adaptive Robotics 2.0. Oral Presentation at Oceanology International, San Diego, CA, USA. Wurl, O., Landing, W., Mustaffa, N. I. H., Ribas-Ribas, M., Witte, C., and C. Zappa. (2019). The ocean’s skin layer in the tropics. Journal of Geophysical Research: Oceans, 124, doi: 10.1029/2018/JCO14021. Baker, E., Walker, S., Resing, J., Chadwick, W., Merle, S., Anderson, M., and D. Butterfield. (2018). Hydrothermal Activity Along Back-Arc Spreading Centers: The Importance of Arc Proximity. Poster Presentation at Ocean Sciences Meeting, Portland, OR, USA. Bartlett, D. (2018). Comparisons of Microbial Life in the Kermadec and Mariana Trenches. Oral Presentation, 6th International Workshop on Deep-Sea Microbiology, Busan, South Korea. Bartlett, D. (2018). Microbial Life at Great Ocean Depths. Oral Presentation, Ocean Biosciences Student Recruitment Seminar, Scripps Institution of Oceanography, San Diego, CA, USA. Bartlett, D. (2018). Microbial Life at the Greatest Ocean Depths. Oral Presentation, Environmental Geology and Geochemistry Seminar, Princeton University, Princeton, NJ, USA. Bartlett, D. (2018). Microbial Life in Pacific Hadal Trenches: Sampling Approaches and Assessments of Diversity and Function. Oral Presentation, NSF Antarctic Biology Course, McMurdo Station, Antarctica. Bartlett, D. (2018).Microbial Life at Great Ocean Depths. Oral Presentation, 30th Squid-Vibrio Meeting, San Diego, CA, USA. Belkin, I., Borges de Sousa, J., Pinto, J., Mendes, R., and Lopez-Castejon, F. (2018). A new front-tracking algorithm for AUVs. Oral Presentation, IEEE OES AUV Conference, Porto, POR. Belkin, I., Borges de Sousa, J., Pinto, J., Mendes, R., Lopez-Castejon, F. (2018). Marine robotics exploration of a large-scale open-ocean front. Oral Presentation, IEEE OES AUV Conference, Porto, POR. Berthelot, H., Duhamel, S., L’Helguen, S., Maguer, J., Wang, S., Cetinic, I., and N. Cassar. (2018). NanoSIMS single cell analyses reveal the contrasting nitrogen sources for small phytoplankton. ISME, doi: 10.1038/s41396-018-0285-8. Bingo, S., Kelley, C., Putts, M., and Moriwake, V. (2018). Identifying and Characterizing High-Density Coral and Sponge Communities on Deep Seamount Ridges Within Papahānaumokuākea Marine National Monument. Oral Presentation, Symposium on Science in Support of Archipelagic Management, Honolulu, HI, USA. Butterfield, D., Chadwick, Jr., W., Larson, B., Tunnicliffe, V., Bates, A., and K. Roe (2018). 2016 Exploration Shows Contrasting Fluid Chemistry and Hydrothermal Vent Communities Between the Mariana Arc and Back-Arc. Oral Presentation, 2018 Ocean Sciences Meeting, Portland, OR, USA. Butterfield, D., Chadwick, Jr., W., Larson, B., Bates, A., and Tunnicliffe, V. (2018). 2016 Exploration Shows Contrasting Fluid Chemistry and Hydrothermal Vent Communities Between the Mariana Arc and Back-Arc. Oral Presentation, Ocean Sciences Meeting, Portland, OR, USA. Chadwick, W., Tunnicliffe, V., Butterfield, D., Bates, A., Huber, J., Trembath-Reichert, E., Bobbitt, A., and Merle, S. (2018). 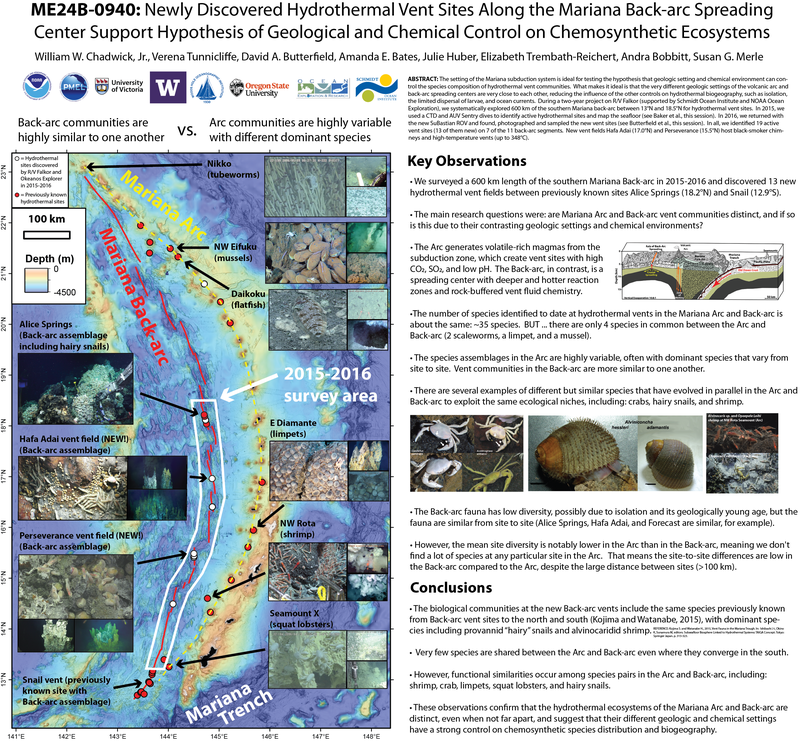 Newly Discovered Hydrothermal Vent Sites Along the Mariana Back-arc Spreading Center Support Hypothesis of Geological and Chemical Control on Chemosynthetic Ecosystems. Poster Presentation at Ocean Sciences Meeting, Portland, OR, USA. Coffin, M. (2018). The World’s Largest Submarine Canyon – Kroenke Canyon in the Western Equatorial Pacific. Oral Presentation, Institute of Oceanology, Chinese Academy of Sciences, Qingdao, China. Coffin, M. (2018). The World’s Largest Submarine Canyon – Kroenke Canyon in the Western Equatorial Pacific. Oral Presentation, Ocean University of China, Qingdao, China. Costa, M., Pinto, J., Sousa Dias, P., Pereira, J., Lima, K., Ribeiro, M., Borges de Sousa, J., Lukaczyk, T., Mendes, R., Tomasino, and et. al. (2018). Field Report: Exploring Fronts with Multiple Robots. Oral Presenation, IEEE OES AUV Conference, Porto, POR. Downing, A., Wallace, G., and Yancey, P. (2018). Organic osmolytes of amphipods from littoral to hadal zones: Increases with depth in trimethylamine N-oxide, scyllo-inositol and other potential pressure counteractants. Deep Sea Research Part I: Oceanographic Research Papers 138 (1-10), doi: 10.1016/j.dsr.2018.05.008. Du Preez, C. and C. Fisher. (2018). Long-Term Stability of Back-Arc Basin Hydrothermal Vents. Frontiers of Marine Science, 5:54, doi: 10.3389/fmars.2018.00054. [This article has been published as OPEN ACCESS]. Garvin, J., Slayback, D., Ferrini, V., Frawley, J., Giguere, C., Asrar, G, and Andersen, K. (2018). Monitoring and Modelling the Rapid Evolution of Earth’s Newest Volcano Island: Hunga Tonga Hunga Ha’apai (Tonga) Using High Spatial Resolution Satellite Observations. Geophysical Research Letters 0 (0), doi: 10.1002/2017/GL076621. Garvin, J., Slayback, D., Ferrini, V., Frawley, J., Giguere, C., Asrar, G., and Anderson, K. (2018). Monitoring and Modeling the Rapid Evolution of Earth’s Newest Volcanic Island: Hunga Tonga Hunga Ha’apai (Tonga) Using High Spatial Resolution Satellite Observations. Geophysical Research Letters, 45, doi: 10.1002/2017GL076621. [This article has been published as Open Access]. Gerringer, M., Andrews, A., Huss, G., Nagashima, K., Popp, B., Clark, M., Linley, T., Jamieson, A., and J. Drazen. (2018). Life history of abyssal and hadal fishes from otolith growth zones and oxygen isotopic compositions. Deep Sea Research I, 132: 37-50, doi: 10.1016/j.dsr.2017.12.002. [This article has been published as OPEN ACCESS]. Green, R., Lowe, R., and Buckley, M. (2018). Hydrodynamics of a tidally-forced coral reef atoll. Journal of Geophysical Research: Oceans, 10.1029/2018JC013946. Marques, O., Alford, M., Pinkel, R., Mackinnon, J., Nash, J., Simmons, H., Brazhnikov, D., Klymak, J., Waterhouse, A., and S. Kelly. (2018). Internal Tide Structure and Variability on the Tasman Slope, Oral Presentation, Ocean Sciences Meeting, Portland, OR, USA. McDermott, J., Sylva, S., Ono, S., German, C., and Seewald, J. (2018). Geochemistry of Fluids from Earth’s Deepest Ridge-crest Hot-springs: Piccard Hydrothermal Vent Field, Mid-Cayman Rise. Geochimica et Cosmochimica Acta, 228, 95-118, doi: 10.1016/j.gca.2018.02.021. Pinto, J., Dias, P., Borges de Sousa, J., (2018). Coordinated operation of multiple AUVs, ASVs, and UAVs using the LSTS tool chain. Oral Presentation, IEEE OES AUV Conference, Porto, POR. Rahlff, J., Ribas-Ribas, M., Brown, S., Mustaffa, N., Renz, J., Peck, M., Bird, K., Cunliffe, M., Melkonian, K., and Zappa, C. (2018). Blue pigmentation of neustonic copepods benefits exploitation of a prey-rich niche at the air-sea boundary. Scientific Reports, 8, 11510. doi: 10.1038/s41598-018-29869-7. Rayson, M., Ivey, G., Jones, N., and O. Finger. (2018). Resolving high-frequency internal waves generated at an isolate coral atoll using an unstructured grid ocean model. Ocean Modeling, 122 (67-84), doi: 10.1016/j.ocemod.2017.12.007. Savage, A., Waterhouse, A., Kelly, S., and J. MacKinnon. (2018). Noncoherence of low mode internal tides in the Tasman Sea, Oral Presentation, Ocean Sciences Meeting, Portland, OR, USA. Smith, J. (2018). Collaborative Seamount Studies in the Johnston Atoll Marine Monument. Oral Presentation, University of Hawaii seminar series, Honolulu, HI, USA. Smith, J. (2018). Geological Mapping of Seamounts and Other Features in the Pacific Marine Protected Areas. Oral Presentation, NOAA Inouye Regional Center distinguished lecture series, Honolulu, HI, USA. Smith, J. and J. Tree. (2018). New Marine Geological Maps for the Northwestern Hawaiian Ridge promote a detailed reexamination of giant landslides and their source volcanoes within a 25 Myr context. Oral Presentation, AGU Fall Meeting, Washington, D.C.